winter wardrobe shopping this season has centered around a few familiar foundations and some new ones. maybe it's because of the holidays, but i've been really in the mood for dresses lately. they're definitely the least well-rounded part of my closet. these days, i find myself drawn to dresses that are feminine but not girly. i finally got the A.P.C. 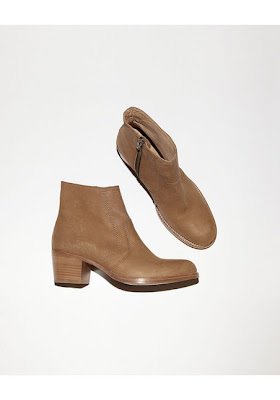 ankle boots that i'd been pining after for so long. truly the perfect light caramel neutral and i can't wait to start wearing them this week. i picked up the silk breton dress that i blogged about last week. it arrived yesterday, and it's a lovely woven silk-twill, fully lined and drapes beautifully. i love that it has pockets! i also got this A.P.C. leopard print shirt-dress that's currently on sale. i saw a shopgirl in the Soho store wear it earlier this fall, and have been thinking about it ever since. i was drawn to the crisp cotton gabardine, which is a midweight material that has a nice drape to it. i find some of the dresses from A.P.C. to be made from material that's thin and flimsy-feeling, but this one checked off all the right boxes for me. have you crossed off any wardrobe planning items lately? and i'm curious – do you wear many dresses? As for dresses--I went through a phase where I would ONLY wear dresses and skirts, but I'm definitely going through a garçon phase right now. It's just too cold to bike in tights sometimes. I love buying dresses but don't actually enjoy wearing them. Consequently I probably have ten or more dresses hanging up in my wardrobe most of which get one outing out per year. It's the whole tights wearing thing which gets me and I don't like the way I have to do the hitch of the tights every half hour before the crotch ends up at my knees. But I do love the look of dresses. And I love both your choices. I do love the APC leopard print - it's the same as on my APC bag (of course) that I picked up in the NAP sale in the summer. Crossed off the perfect black winter coat -- oversized, black, by Hope, as well as a few wool APC cardigans on sale to wear through March, and wool Acne scarves in gray and camel. The only other thing I really wanted for winter (and year-round) was a pair of black leather loafers for when I don't want to wear boots, but the ones I want are forever sold out in my size... hopefully soon! After that I swear to myself I'm not buying anything ever again (ha). I would love to wear dresses, but I find them to be really summery, colours, lightness of them. Do you think a bright white or light blue dress would look ridiculous in wintery weather? Also, what kind of shoes to wear with them? I assume Nike sneakers is not the right choice. Yes, I love dresses! They are one of my year-round essentials. In fall and winter I love my wool and silk dresses- they're just an easy way to go from the office to an evening event. I feel like the autumn and fall here are far more event heavy. I don't like anything girly, but love a polished and well tailored dress. I tend to rely on a handful of brands that get it right. So glad to hear that you found a couple of dresses that work so well for you. you're the queen of the elegant, feminine ensemble :) i also love how Sofia wears dresses - she manages to look feminine and not frilly. LOVE that. I've managed to cross two items off my Summer planning wishlist - a cream jumper and a stripe tee. I think the jumper may be a little bit heavier than what I was expecting, especially as the weather has been peculiarly lovely lately, but it will be a workhorse come the winter months. The tee is just what I was after. I love the look of that J Crew one - it looks gorgeous on you! I love a good stripe! I love my Breton cotton knit dresses by Muji - so easy to maintain. I do enjoy wearing trousers but the bulk of my wardrobe is dress-based. I love dresses by DVF, Bi La Li, Development, Vince, White Champa. They are so easy to wear and accessorize. I have picked up a couple more items in the sales - wasn't planning on it but it's hard to resist a classic staple at a good price...aka calf leather ballerina shoes in black, a long gold-plated necklace interspersed with pearls and a supremely elegant pair of black strappy sandals by Bally that will be a good, muted alternative to my more "fashion" platform sandals. i am going to pester you for photos of your sale finds! i am also starting to think that a great pair of platform sandals is an essential - they are so versatile and flattering, way more than you'd think at first! Love your blog! Dresses are the foundation of my wardrobe! Then come skirts and trousers, because I'm so bad at mixing and matching. They work for me all year round: winter I wear wool and heavier knit dresses, tights and knee or ankle boots, lighter weight versions or less layers for spring, and summer means shift, shirt and safari styles. I don't tend to wear classic heels with them though as it's too girly/dressy for me, usually more covered shoes, gladiator heels or good flats. I'm currently on the look out for basic 'tennis' shoes. i think i prefer dresses as they're so easy to wear. i'm terrible at coordinating skirts and it just seems too fussy most of the time. they're also listed in my Essentials tab! The sales have been good- I bought a pair of IM Jenny boots. And now I'm eyeing a pair of Mark Mcnairy brogues. Madness! Is it crazy to only by shoes this season? Also, the apc boots are great. I have a bright yellow pair from last year. I was suspicious at first but no more. Sales are still a few days away in France but with Internet, we get to have an early start and taste of it thanks to our British neighbors! I'm considering a Carven skirt on NAP but I'll wait for French sales on that one especially as I've no tried it yet. Also have eyes on these APC boots!! They look so great, I hope they'll be featured soon here!